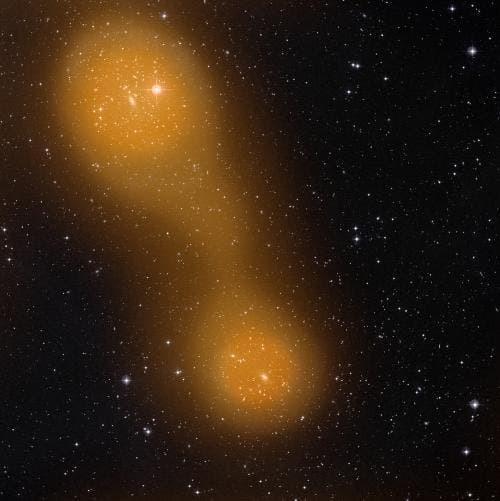 ESA’s Planck space telescope has made the first conclusive detection of a bridge of hot gas connecting clusters Abell 399 and Abell 401, each containing hundreds of galaxies across 10 million light-years of intergalactic space. Planck’s primary task is to capture the most ancient light of the cosmos, the Cosmic Microwave Background, or CMB. As this faint light traverses the Universe, it encounters different types of structure including galaxies and galaxy clusters – assemblies of hundreds to thousands of galaxies bound together by gravity. If the CMB light interacts with the hot gas permeating these huge cosmic structures, its energy distribution is modified in a characteristic way, a phenomenon known as the Sunyaev–Zel’dovich (SZ) effect, after the scientists who discovered it. This effect has already been used by Planck to detect galaxy clusters themselves, but it also provides a way to detect faint filaments of gas that might connect one cluster to another. At least part of this gas might derive from the warm-hot intergalactic medium (WHIM) – the elusive web of gaseous filaments which is believed to pervade the Universe. The current understanding of cosmology suggests that the Universe is dominated by dark matter and dark energy. The remaining 'normal' matter – or baryonic matter – of which stars and planets are made, accounts for just a tiny fraction of the cosmic budget, less than five per cent. Baryonic matter can, in principle, be detected through the electromagnetic radiation it releases. But there's a problem: the amounts of baryonic matter detected via astronomical observations in the distant, ancient Universe and in the nearby one do not match. Astronomers have struggled to locate about half of the baryonic matter expected to be present in the local Universe. A leading candidate for the location of these so-called 'missing baryons' is the warm-hot intergalactic medium or WHIM. The WHIM is the baryonic component of the cosmic web, a filamentary network of both dark and baryonic matter that is believed to pervade the Universe. Numerical simulations of the formation of cosmic structure predict that galaxies and galaxy clusters are embedded in the cosmic web, and that the WHIM might account for most of the baryonic matter in the local Universe. In the early Universe, filaments of gaseous matter pervaded the cosmos in a giant web, with clusters eventually forming in the densest nodes. Much of this tenuous, filamentary gas remains undetected, but astronomers expect that it could most likely be found between interacting galaxy clusters, where the filaments are compressed and heated up, making them easier to spot. By combining the Planck data with archival X-ray observations from the German satellite Rosat, the temperature of the gas in the bridge is found to be similar to the temperature of the gas in the two clusters – on the order of 80 million degrees Celsius. Early analysis suggests the gas could be mixture of the elusive filaments of the cosmic web mixed with gas originating from the clusters. A more detailed analysis and the possible detection of gas bridges connecting other clusters will help to provide a more conclusive answer. The new finding highlights the ability of Planck to probe galaxy clusters to their outskirts and beyond, examining their connection with the gas that permeates the entire Universe and from which all groups of galaxies formed. The image at the top of the page shows the two galaxy clusters Abell 399 and Abell 401, which can be seen in the upper left corner (Abell 401) and in the central lower portion of the image (Abell 399), respectively. They are located at redshift z~0.07 – about one billion light-years away from us. In the optical image, obtained with ground-based telescopes, galaxies are visible as slightly elliptical, bright flecks. The two clusters can be seen as the two portions of the images that show a higher concentration of galaxies. The image is also dotted with several foreground stars that belong to our Galaxy, the Milky Way. Depicted in orange is the hot gas that pervades the two clusters and the space between them, based on data from ESA's Planck satellite. Planck can detect the hot gas via the Sunyaev-Zel'dovich effect.